Some people say that the hippie movement was about promoting love, peace, and tolerance. But we were there, man, and from the roughly eight nonconsecutive minutes we can recall during the 60s we can say without a shadow of a doubt that they were about one thing only: outta sight, totally boss, shining, gleaming, streaming, flaxen, waxen hair. And we had the most hair. We even dodged the draft because the draft board mistook us for a lhasa apso napping on top of a pile of dirty laundry! If you want to look like a hippie but don’t want to spend two years sleeping in the backseat of a beat up 1958 Ford Edsel, then we’ve got you covered. 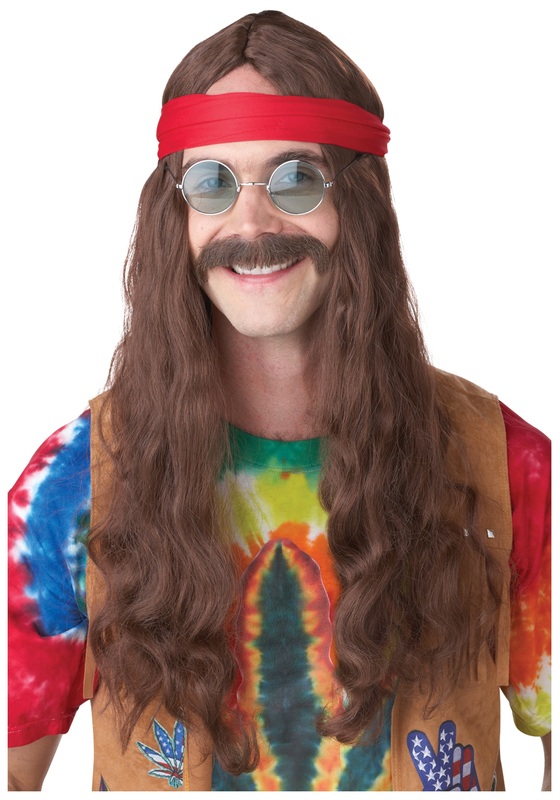 Our Hippie Man Wig and Mustache will give you that hirsute come hither look you’ve been pining for in a matter of seconds thanks to the comfiness of the wig and the self-adhesive mustache! This may very well be as far out as it gets. This wig and mustache will transform you. No one will recognize you. Awesome! The part line is frizzed from possibly being melted by heat and there was no mustache. The hair is very wavy and auburn so it looks like a woman's wig. It doesn't match the dark brown in the picture.